Prepare yourself: The CEO of HBO’s parent company recently said that being declared the most pirated television show in the world was better than winning an Emmy. No, you didn’t slip into some kind of bizarro world while you were sleeping. Time Warner CEO Jeff Bewkes actually gave piracy a big thumbs up in response to an analyst question during the company’s earnings call on Wednesday. At least for now it is. You see, Bewkes’ approach to piracy is that digital freeloaders actually lead to more subscribers for HBO down the road. In other words, piracy eventually brings in more revenue. While it’s surprising to hear this argument from the head of a global entertainment conglomerate, this is not the first time content creators have said that piracy can be good for business. Brazilian author Paul Coelho (The Alchemist) rose to fame after distributing his own books through pirate channels unbeknownst to his publisher. Sci-fi author Cory Doctorow also freely distributes e-book versions of his novels and non-fiction work. In both cases, the authors felt it was better to get their work out there for readers to discover and share rather than trying to sell their books into obscurity. Not everyone feels the same way, however. 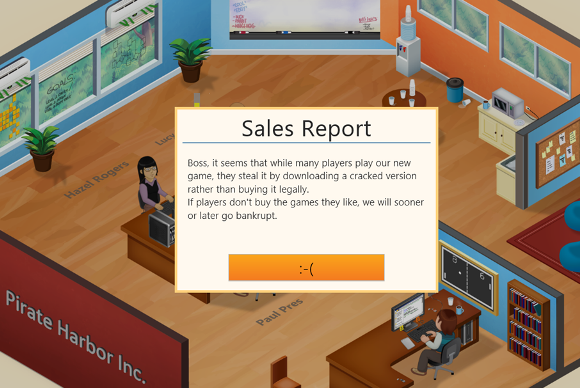 The creators of Game Dev Tycoon, a video game business simulation game for PCs, hilariously battled piracy by introducing a piracy element into the story of a pirated version of their game. As players in GDT attempted to build up their virtual game studio, piracy would begin to gnaw away at their profits, ultimately forcing the company to go bankrupt. Game over. Game Dev Tycoon doesn't like pirates. When you scale up to HBO’s production size, however, it appears that piracy really can pay off by bringing in more viewers, and eventually more subscribers. Bewkes is not the first person attached to HBO and Game of Thrones to argue that piracy was either helping or not really impacting the bottom line. In April, HBO programming head Michael Lombardo told Entertainment Weekly that piracy was not impacting DVD sales for the fantasy series. Several months earlier, in February, director David Petrarca, who worked on several episodes of Game of Thrones, said piracy was not negatively impacting the show. But it’s not as if all of Time Warner is gung-ho for piracy. Just a few weeks ago in June, reports surfaced that Warner Bros. Pictures was going after illegal downloaders and trying to scare them into paying the studio $20 per copyright infringement. HBO, meanwhile, is trying to battle piracy by offering a better product, at least to customers outside the U.S. During the kick-off to the third season of Game of Thrones in March, HBO introduced an accelerated schedule for international releases of new episodes. So instead of waiting weeks or months after Game of Thrones’ U.S. air dates, international broadcasters could air the episodes within 24 hours of their U.S. debut. To meet consumer demand in the U.S. there are also persistent reports about HBO looking at decoupling HBO Go, an online VOD service, from cable subscriptions. Time Warner as a whole certainly isn’t speaking with a uniform voice when it comes to piracy, but HBO is slowly becoming a thought leader for Hollywood on how to grapple with the digital age. Whether that trend will continue, however, is anybody’s guess. Game of Thrones is currently up for 16 Emmy Awards at this year’s celebration of primetime TV in September.